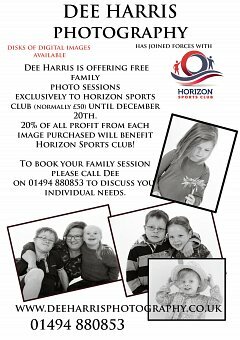 Dee Harris is offering a free family photo session (usually costing £50) exclusively to friends and supporters of Horizon Sports Club with 20% of profits from any purchased image going directly to Horizon. Dee is a fantastic photographer who creates beautiful natural photos from her relaxed home based studio in high Wycombe. Her offer ends on the 20th December so get in touch with her if you are interested.